Sample locally made wine and beer, take off on an outdoor adventure, kick up your heels at a dance hall and shop one-of-a-kind boutiques in these 15 charming small towns found in beautiful Texas Hill Country. Sip your way through the Distillery District, which boasts wineries, breweries and distilleries. Cool off in the aquamarine waters of Hamilton Pool Preserve, featuring a 50-foot waterfall. Step back in time at the Dr. Pound Historical Farmstead & Museum, built by one of Dripping Springs’ founding families. Dig into family recipe brisket and pork ribs at The Salt Lick BBQ, a cash-only barbecue destination. Then head off on the Driftwood Wine Trail, where you can sample award-winning wines at popular spots like Duchman Family Winery and Fall Creek Vineyards. Camp out under the stars with fellow music lovers during the annual Old Settler’s Music Festival, when bluegrass and folk artists perform every April. Or put the pedal to the metal at the Rally Ready Driving School, where gear heads learn to drive a rally car from champion racers. Visit the childhood home of the 36th president of the United States at the Lyndon B. Johnson National Historical Park. Hike the trails and check out the awesome twin falls at Pedernales Falls State Park. Or take a safari tour and see more than 500 wild animals at Exotic Resort Zoo. Pick up a souvenir T-shirt at the legendary Luckenbach Texas General Store (housed in an 1800s trading post) or catch a country western concert at Luckenbach Dance Hall in this tiny town that was immortalized in song by country superstars Willie Nelson and Waylon Jennings. Enchanted Rock. Credit Pierce Ingram. 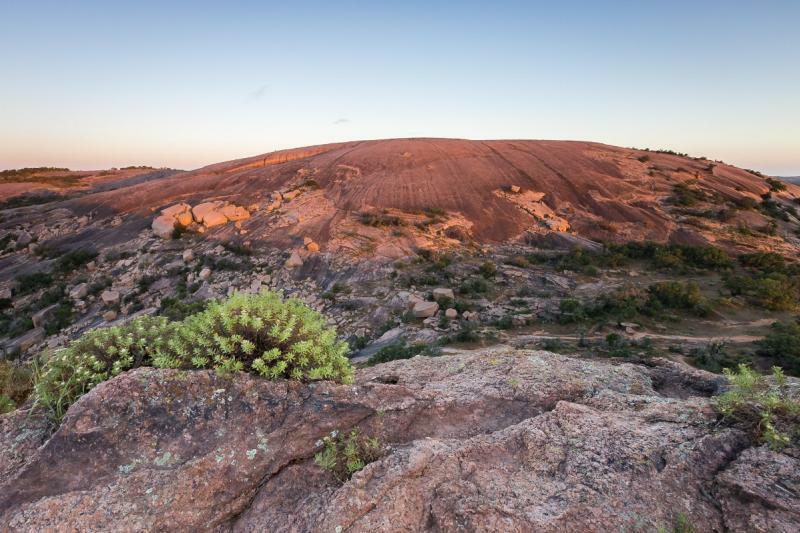 Climb the 425-foot-tall pink granite dome at Enchanted Rock State Natural Area for a panoramic view. Hit Fredericksburg Wine Road 290 and make stops at 16 wineries, including Becker Vineyards and Pedernales Cellars. Reflect in the peaceful Japanese garden at the National Museum of the Pacific War. Shop and sip along the Hill Country Mile, home to charming boutiques and restaurants in the heart of downtown. Kick back with a craft beer at one of the locally owned breweries, including The Dodging Duck Brewhouse and the kid-friendly Random. Go on an underground adventure at Cascade Caverns. Kayak or lazily float in a tube along the pristine San Marcos River that meanders through the center of town. Explore a cave and ride a tram through a waterfall at Wonder World Park. Get your shopping fix at two sprawling outlet malls: San Marcos Premium Outlets and Tanger Outlets. Ride a wild water coaster at Schlitterbahn Waterpark & Resort. Tour more than a dozen breweries on the Hill Country Craft Beer Trail. Grab an inner tube and ride the currents of the spring-fed Comal and Guadalupe Rivers that pass through New Braunfels. 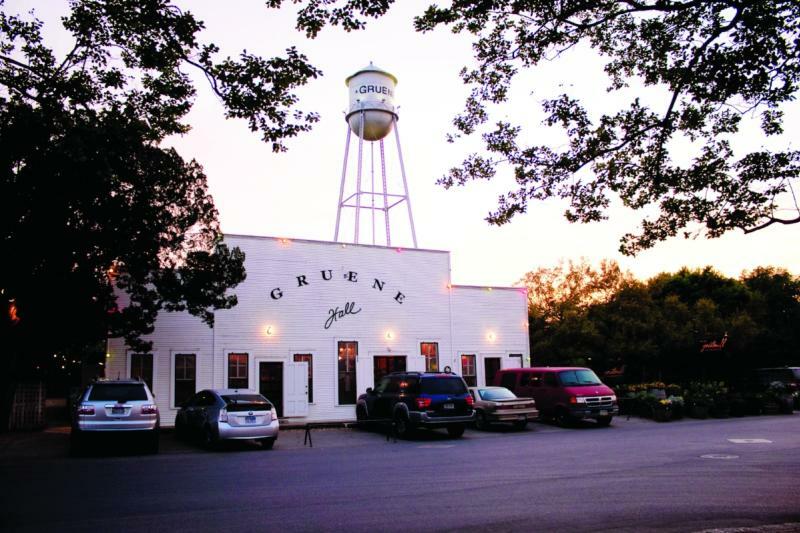 Gruene Hall. Courtesy of Gruene Historic District. Stroll the streets of the Gruene Historic District and browse the shops housed in 19th-century brick storefronts. Boot scoot across the wooden floorboards of Gruene Hall, Texas’ oldest dance hall, where big-name music stars and up-and-comers have been performing since 1878. Jacob’s Well is home to one of Texas’ longest underwater caves. Wander through art galleries and watch artists craft colorful sculptures at Wimberley Glassworks. Stop by Bella Vista Ranch to pick up a bottle of fresh-pressed olive oil or small batch wine. Belly up to The Barbecue Capital of Texas, where lip-smacking restaurants include The Original Black’s Barbecue, family-run since 1932. Marvel at the architecture of the Caldwell County Courthouse and browse the fun shops, galleries, restaurants and historic theater around the town square. See where outlaws were once held at the Caldwell County Jail Museum. Shoppers flock to Henkel Square Market (with art galleries and eateries nestled in renovated 1800s homes) and the Bybee Square shops across the street. Find gems like fine glass and vintage silver during The Original Round Top Antiques Fair, held in fall and spring. Talk a walk through downtown Courthouse Square, where beautifully preserved Victorian-era buildings house shops and restaurants. See a play at the 1920s Georgetown Palace Theatre. Explore caves dotted with stalactites and awe-inspiring rock formations at Inner Space Cavern. Go swimming or boating on scenic Lake Marble Falls. Hop on an ATV and get revved to ride the off-road trails at Hidden Falls Adventure Park. Try the chicken-fried steak with a slice of homemade pie from the iconic Blue Bonnet Cafe, open since 1929.